When is a race not a race? More to the point, when is a racer not a racer? When it’s ONRUSH. This new IP from racing gurus Codemasters, certainly takes the bog standard racing game in a different direction. The first, and most notable, is that it’s not a racer at all. It features no pole positions or finishing lines. So if you’re a fan of passing the chequered flag at high speed, forget it. So if it’s not a racing game, what exactly is it? Well, it can probably be best described as a driving combat game. You choose from a selection of eight vehicles to drive: two bikes and six cars of various shapes and sizes. Each vehicle has its own particular abilities that can help you along the course. Once you’ve chosen your ride, you’re then split into two teams, so that when you win, you win as a team, even if you’re playing in single player mode. So if there are no prizes for finishing first, how does your team win? Well, more often than not, by knocking out your opponent. Unfortunately, the combat side of things is a little flimsy; no red shells, or any other projectiles for that matter, it’s mostly a case of either knocking your opponent into a wall or landing on them from a great height from a jump. So echoes of early Burnouts then; actually Burnout isn’t a bad comparison, just without the racing element. Putting graffiti on walls is one thing, but on our cars?! The four team based modes available – again for both single player and multiplayer – are Overdrive, Switch, Lockdown and Countdown. All of them are variations on a theme, working as a team to win, but are distinctive enough in their own right to keep you coming back. Lockdown, for instance, sees you chasing a moving zone, which you and your team mates have to take control of by driving in it until you’ve won it. It’s like Capture the Flag, if said flag was attached to a moving vehicle. One of the interesting elements is how the game feels like a multiplayer experience, even when playing the single player mode. This is great if you have no real friends, and also means you can blame one of your AI team mates if you end up losing. The problem with this seamless gaming experience from single player to online is that they feel exactly the same. The online side of things doesn’t feel any different, like it would with a racing game for instance, so it all feels watered down. Still, there is an opportunity to chat with teammates during play, in an attempt to discuss some kind of strategy, which is usually the sole domain of the FPS, so that’s a nice touch. The USP of not being a racing game however, is also its Achilles heel. If there’s no line to cross, then there’s no need to be in first place. This is echoed by the Rush element of the game, essentially it’s a turbo facility that you can engage at various times, which can help ram opponents off the road. The problem is, you don’t really notice any difference in speed when you activate it. It feels like everyone is going at the same speed, regardless of if they’re using Rush or not. After a while, you start to feel like the game’s on some kind of conveyor belt, like a nifty Scalextric set, where you’re just moving your vehicle left and right to avoid any obstacles. Sometimes even us cars just need a wee lie down. The more you play ONRUSH however, the more you learn to forgive it for what it isn’t, and embrace it for what it is . And that is, a different approach to a driving game that despite its misgivings, is a fun-fuelled experience. The single player mode is fairly extensive, with every section having varied objectives to meet before you can clear it completely. The 12 courses are varied, albeit a tad generic in some cases, but include enough jumps and obstacles to keep you alert at the wheel. What it keeps in its boot however, is a huge amount of fun. It’s fast, frenzied and furiously intent on being a thrilling ride with a difference. 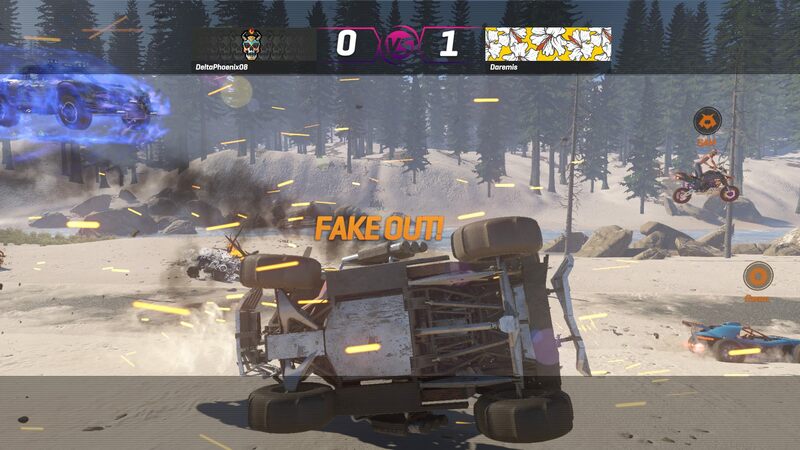 ONRUSH should be applauded for attempting to bring something new and fresh to a very tired and predictable genre. 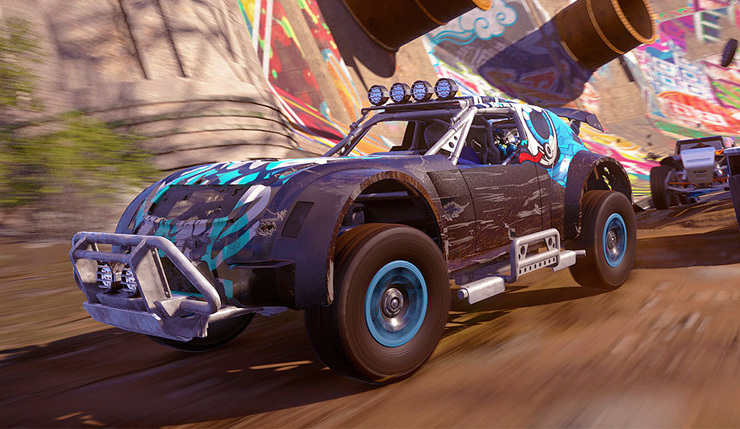 Remember, if you want a racing game, there are plenty out there, but if you want to be brutish in the driving seat, bullying competitors off the road, for you and your team to enjoy the victory, then its ONRUSH for the win. As long as you remember it’s not a racing game but a driving combat game, then you’ll be on the right track.